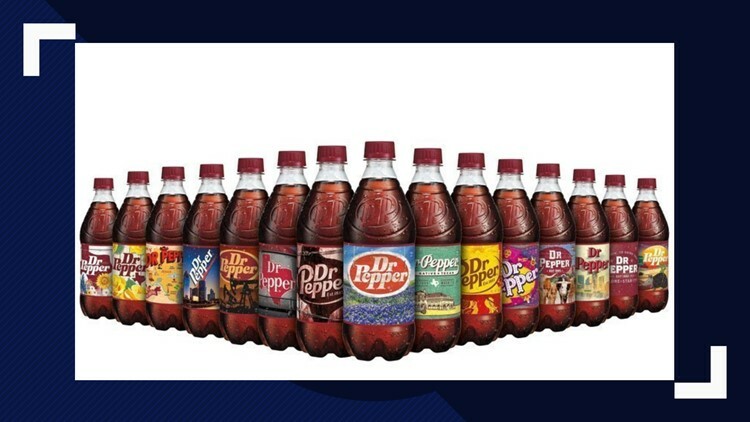 Dr. Pepper releases labels celebrating its Texas heritage. WACO, Texas — Dr. Pepper is to Texas as Coca Cola is to Georgia. It is a source of pride. For some Texans, a cold Dr. Pepper is a special elixir that warms the heart and soul. Originating in Waco in 1885, Dr. Pepper is older than its major competitors like Coca Cola. It is one of the most widely recognizable brands in the country and throughout the world. Dr. Pepper advertises itself as the official drink of college football, even sponsoring the championship trophy. Dr. Pepper posted a petition on Change.org to the Texas State House hoping to officially be named the Texas State Soft Drink. "Dr Pepper has a rich, storied history in the great state of Texas and being named its official soft drink would mark a new milestone for the beloved brand to celebrate for generations to come," the petition says. According to the petition, Dr. Pepper is the oldest of all the major soft drinks in the country. Since the first batch was made in Waco, Dr. Pepper has grown exponentially with iconic advertisements and signs. As a symbol of Texas, Dr. Pepper released 15 labels celebrating Texas heritage with landmarks and landscapes. Those labels are available in Dallas-Fort Worth, Houston and Dr. Pepper's home in Waco. If you would like to add your name to the petition, you can follow this link and make your voice heard. The petition also asks folks to use #DrPepperLovesTX on social media to help the cause.